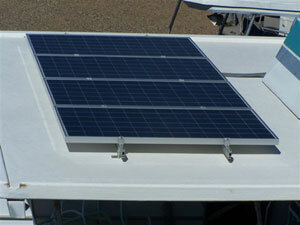 Donn’s Boat Shop, Inc. is a solar specialist. We engineer everything we do and meet or exceed residential and commercial codes. We ship and install anywhere, partner with other dealers on sales and installs, have pre engineered packages for rental fleets, private houseboats, solar for marinas grid tied or stand alone. 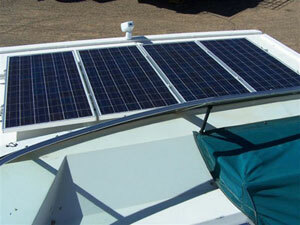 We have come up with a great system for houseboats to run their complete DC systems along with an inverter to run all of their AC requirements while being charged by the sun via solar panels. We have houseboats that never run the generator (unless they want the air conditioning on) but yet have refrigerators, ice makers, deep freezers, etc that stay on 24/7! Did you know that the sun in 24 hours can produce ALL of the energy needs for the whole planet earth for 365 days? Most of our partnership owner houseboats have stopped using their generator, replaced it with solar and an inverter, for the cost of what they would spend on generator gas for one week! Now they do not have to change oil in their generator as often or worry about wear in tear on the generator. Solar panels last for 25 years. Will your generator last that long? Donn’s Boat Shop, Inc. along with our other company, Sun Volt Engineering, does large commercial projects, grid tied and stand alone systems, residential systems such as cabins or commercial buildings in the wilderness without power. Just because gas prices are high does not mean you should not be able to enjoy your same quality of life! So whatever your needs are give us a call and we can engineer a system for you that will give you years of service.